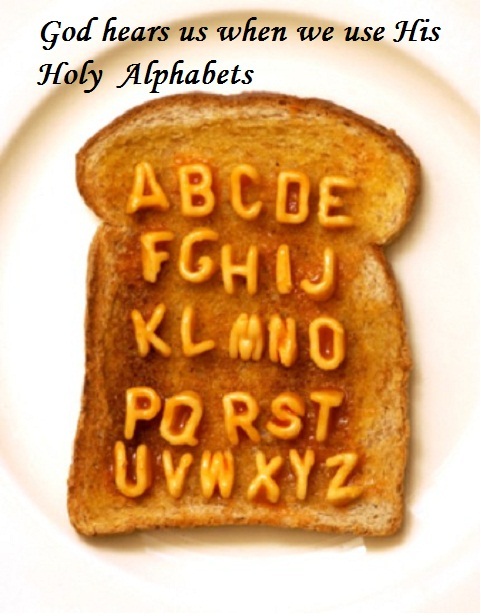 Apostolic Titbits: Use Holy Alphabets! "1 God, we look forward to praising you in Zion. We will keep our promises to you. 2 All people will come to you, because you hear and answer prayer. 3 When our sins became too much for us, you forgave our lawless acts. 4 Blessed are those you choose and bring near to worship you. You bring us into the courtyards of your holy temple. There in your house we are filled with all kinds of good things. 5 God our Savior, you answer us by doing wonderful things. You save us by your power. People all over the world and beyond the farthest oceans put their hope in you." (Psa 65:1-5, TNIV). Even though we may be facing trials in our life, our outlook towards life should be by seeing through the wonderful abbreviations of these HOLY ALPHABETS. Whe we learn to speak this way of life, even the hardest trial may be sailed through from strength above. Never forget to say to God like the king Asa did in one of his hardest time of life threatening trial, "...“LORD, it is nothing for You to help, whether with many or with those who have no power; help us, O LORD our God, for we rest on You, and in Your name we go against this multitude [of problems in our life]. O LORD, You are our God; do not let man [or devil] prevail against You!"" (2 Chronicles 14:11). In other words, as we confess to God and praise Him for who He is to us and the power of His might over every circumstances we face, we are telling to God that it is not against us these problems of life are coming, but against Him who does not allow anyone to stand against Him and glorify in their own strength. I promise you, God will be very pleased with your prayer and will also strike those demonic or man made problems with a vengeance. As He was pleased with king Asa and struck his enemies, exactly in the same way He will help you too (2 Chron 14:12-13). As the Scripture says, when God arises His enemies will flee (Psa 68:1), this is what happened to Asa the king who praised God and it will also happen to you as you keep pronouncing those HOLY ALPHABETS in your life with expectation. Hallelujah! Amen, GLORY TO GOD FOREVER & EVER!